According to the Environmental Protection Agency, “Stormwater runoff is generated when precipitation from rain events flows over land or impervious surfaces and does not percolate into the ground. As the runoff flows over the land or impervious surfaces (paved streets, parking lots, and building rooftops), it accumulates debris, chemicals, sediment or other pollutants that could adversely affect water quality if the runoff is discharged untreated.” Stormwater runs off forested areas, agricultural lands, rural and urban areas, dirt and paved roads, industrial sites, and construction sites. 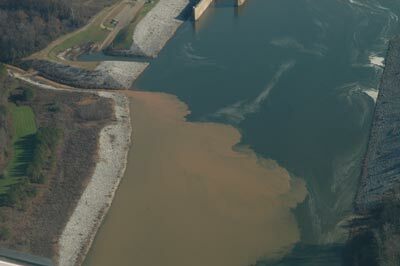 All of these types of stormwater contribute pollution to streams in the Black Warrior River watershed. Black Warrior Riverkeeper has decided to increase our focus on construction stormwater issues to address muddy water runoff that is harming our streams, wildlife habitat, property, and drinking water. Although muddy water from construction sites may seem fairly innocuous compared to other pollutants on which we often focus, such as sewage and industrial chemicals, dirt is a serious ecological problem. Utilizing our core strategies of patrolling and litigation, we have had success addressing construction stormwater runoff problems, particularly in our case against the Birmingham Airport Authority. Still, the non-point source nature of stormwater runoff often lends itself less toward individual enforcement actions and more toward stakeholder meetings and statewide policy considerations. In scheduling more frequent, amicable, and informative meetings with major stakeholders in the construction arena (municipalities, construction firms, and developers), our goal is to improve relationships, understanding, and compliance at key sites in the watershed. Beyond the boundaries of our watershed, in collaborating more frequently with other nonprofit organizations and government agencies, our goal is to help improve local and statewide stormwater policy. The Clean Water Act (CWA) is in place to prevent local municipalities from allowing pollution to runoff into streams through municipal storm sewer systems (MS4s). Through the CWA, the Environmental Protection Agency requires state agencies and local municipalities to oversee regulation of stormwater pollution. 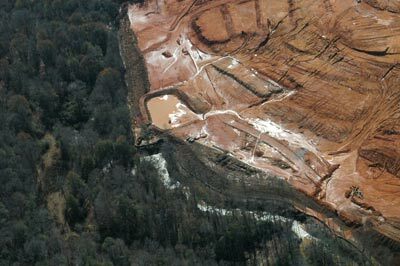 Best management practices for erosion control and sediment control — such as staged land clearing, soil stabilization, established ground cover, erosion matting, site grading, drainage check dams, sediment ponds, and properly maintained silt fences — help prevent damage to water quality. Black Warrior Riverkeeper is a member of the Alabama Stormwater Partnership (ASP). ASP was formed in June 2007 by a collection of organizations concerned about the damaging effects of stormwater in Alabama’s waterways. ASP is made up of 17 local, state, regional and national members including Alabama Coastal Foundation, Alabama Rivers Alliance, Cahaba River Society, Cahaba Riverkeeper, Choctawhatchee Riverkeeper, Conservation Alabama, Hurricane Creekkeeper, Mobile Baykeeper, and Southern Environmental Law Center. These organizations work throughout Alabama to protect and improve water quality, much of which is negatively affected by municipal stormwater pollution. ASP has continued advocating for stronger oversight by regulatory authorities by meeting with officials at EPA, state agencies, and local governments as well as providing comments on stormwater regulations currently under revision. Together with ASP, over the past year we have been closely following the Alabama Department of Environmental Management’s (ADEM) development of the Phase II general stormwater permit that regulates discharges from regulated small municipal separate storm sewer systems (“small MS4s”). This permit spells out the legal requirements for programs that small MS4s must implement and enforce to control stormwater discharges in their jurisdictions. The drafting of this permit is not just important to ensure that small MS4s follow the law and reduce stormwater pollution to the maximum extent practicable; ADEM has stated that this permit would be the “template” for the development of the two other permits that it must issue before the end of the year: the Phase I general permit (for cities in urbanized areas) and the general construction permit. Each of these permits has a term of five years. We collaborated with ASP to try to get the strongest, most protective permit possible, one that meets requirements of the Clean Water Act. In our opinion, ADEM’s Phase II permit did not meet the requirements of applicable law. EPA agreed with us and objected to ADEM’s Phase II general stormwater permit on August 9, 2010. The EPA objection is unprecedented; it is the first time EPA has objected to a state’s proposed stormwater permit. ADEM submitted a revised permit, as a result, which has been accepted by EPA. In addition to these collaborative initiatives, our traditional practice of patrolling (and litigating when necessary) will remain an important tactic to address stormwater pollution. 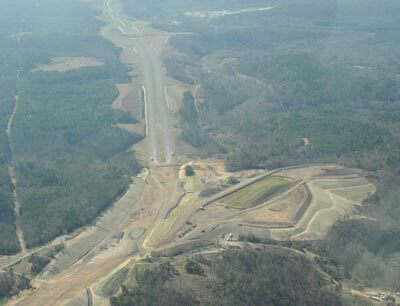 Through diligent patrols by our Riverkeeper, Nelson Brooke, our pollution case against the Birmingham Airport Authority (BAA) was closed on February 16, 2010, signifying that the BAA had fulfilled the requirements set during settlement. Since settling with us one year ago, the BAA spent over $1.7 million implementing erosion controls and sediment controls at their runway extension construction site. 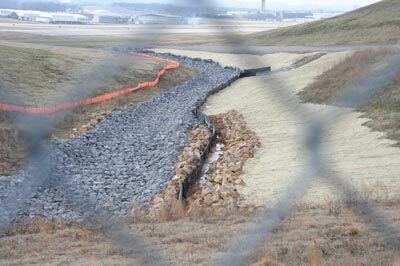 Additional erosion control measures were added to this drainage at the Birmingham Airport in response to our case settlement. Photo by Nelson Brooke.